If you are thinking about separation or divorce, it is time to get organized and start planning for the future. Why? Because every single thing you do to help your case saves you time and money. Why is divorce so hard? It’s because every single case is unique, and the “emotional” needs and desires of the parties and everyone else involved often clash with the limitations of “the law.” And what is the "law" looking at? In short: everything! For starters: the contributions, monetary and non-monetary, of each party to the well-being of the family, the value of all property interests of each party, the economic circumstances of each party at the time of the divorce, the circumstances that contributed to the estrangement of the parties, the duration of the marriage, the age of each party, the physical and mental condition of each party, how the property of the parties was acquired (gift, inheritance, purchased during the marriage), the contribution by each party to the acquisition of the property, possibility of alimony award, the financial needs and financial resources of each party, all income and assets of the parties, the financial obligations of the parties, and any other factor the court deems necessary or appropriate to consider to arrive at a fair and equitable monetary award and the dissolution of the marriage. So, you can see that every person’s situation is different. The circumstances are different. If the parties are reasonable, the divorce can be reasonable. If, however, the parties are unreasonable, are seeking “revenge” or are just out “to punish” the other party, everyone is in for a difficult and expensive road ahead. In either case, your strategy must fit your case and your objectives—it must be yours alone! And even if you have gone through a divorce before, there are still many uncertainties, many questions. I help you develop your strategy for your case! Whether you settle your case (which is the ideal) or whether you try your case (which is not ideal), I will be a vigorous advocate for you and your case. I have tried hundreds of cases, and I am totally ready “for the fight,” but for you and each of my client’s sake, an equitable settlement is far preferable to going to trial. In a “normal” civil case, the dispute generally boils down to money. But, in a divorce case, it is much more complicated. Why? Because in a divorce case, it is not only about money, it also about you, your spouse, your family, your history, your future, and much more, as I have discussed briefly above. If you have children, THEY become a primary focus, and so much is going to depend on their needs and their future. So, in every case, your specific facts and circumstances are all important. Essentially, everything is potentially relevant and practically nothing is beyond the scope of inquiry—if it’s relevant to any issues in your case. And this is why it is so important and critical for you to have a well thought out strategy going forward. This is what I help you do. I help you see and understand the forces that may be working against you. The forces include the court system itself, the reasonableness or unreasonableness of each party, the actions or inactions of each party, the involvement of others, the resources of each party, the needs of each party and children, if any, and the costs associated with the actions or inactions that you and others involved take or don’t take. A divorce takes planning, thought, and organization. To work through the divorce process, I ask my clients to pour their hurt, anger, disappointment, hopes and fears, frustration, and countless other emotions into me, and, working together, we create a strategy and approach to get you through these trying times. My ultimate goal in every divorce case is to settle the case “out of court.” This means that the two parties, husband and wife, have to come to a settlement agreement on all issues in their case, including an equitable property settlement, monetary award, alimony or no alimony, child custody and visitation, child support, and all other “money” issues in the case. Without a settlement, the parties must go through a final hearing (trial) before the court. One of the hardest hurdles to overcome in divorces cases, I have found, is the disconnect between “what the parties want” and what the court can or will actually do! Often, parties are acting and reacting “emotionally,” and the court is not. It is responding “legally,” meaning the court is looking at the facts and circumstances of each case, cold “dollars and cents,” what IT perceives to be in the “best interests” of the children and what IT perceives to be “equitable.” If there are no minor children, the court’s approach to divorce is in many respects like the break-up of a business. So, questions revolve around, “Who owns what?” “Where is the money?” “Who earns what?” “How can we distribute the property equitably?” “What happens to the house, cars, retirement funds, investments, etc. ?“ “Should there be a monetary award?” And many related questions. But no matter what the court orders, it's the Mom or Dad who actually has to do (or not do) something! And if one party does not comply, the other party will have to pursue enforcement and seek attorneys fees to do so. So, it is smarter for the parties to settle the case themselves--if at all possible. Of course, even with a settlement, parties still need to answer these questions to reach an amicable settlement. But, with a settlement, the parties have total control and say over how they end their marriage, distribute their property, care for the children, and move forward with their lives. Again, this is the best possible way to go. HELPFUL HINT: Be safe, write out your questions, collect your important papers, and get the information you need before you act. For custody and visitation of the children, the court focuses on “what is in the best interests” of the children and has full power to consider all aspects of what is in the best interests of the children. So, the court will be asking, “Who should have custody of the children?” “Where should the children primarily live?” “What are the special needs, if any, of the children?” “What should the visitation schedule and conditions be?” And many many other related questions. There is no rule or law that says the children should go with the mother or the father. It all depends on the circumstances of each case. And in every case, the court can consider virtually all aspects of what the children need and what is the best situation for them going forward. Again, if the parents can agree on what is in the best interests of their children, this is a huge plus—and will save everyone, especially the children, a lot of pain and torment going forward, and will—of course, also save you a lot of anxiety and costs going through the whole divorce process. So, again, everything you can agree on is GOOD! Very good! HELPFUL HINT: Really think about your kids and what is best for them. Child support payments are determined based on a set schedule adopted by the State of Maryland based on where the children live and the gross incomes of the mother and father. Certain deviations may apply under special circumstances. HELPFUL HINT: Collect wage and income statements and all of your financial documents for both sides. 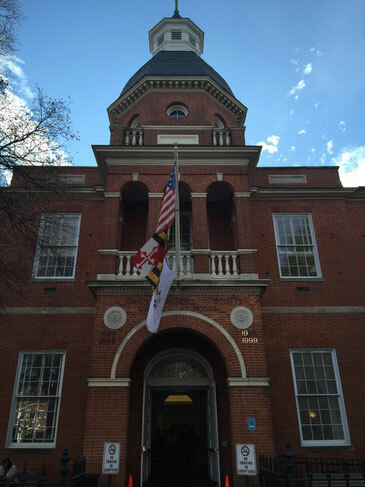 In Maryland, there is no set “formula” for alimony and no “legal right” to alimony during or after a divorce action. Because Maryland law favors each party being self-supporting, alimony is generally considered “rehabilitative” rather than an entitlement. In certain circumstances, however, a party may demonstrate a need for “permanent” alimony. To determine whether a spouse will be granted alimony, the court considers a number of factors, including the length of the marriage, the financial needs and resources of each party, how long it will take the party seeking alimony to find “suitable employment” and to become “self-supporting,” the ability of the party from whom alimony is sought to pay alimony and still meet his/her own needs, the age and health of each party, the contributions (monetary and non-monetary) each party made during the marriage, the duration of the marriage, the standard of living the parties had during the marriage, retirement benefits of the parties, financial obligations of the parties, how the rest of the property was split between the parties, and all other related financial and non-financial information that the court chooses to consider. HELPFUL HINT: Think about your needs and your spouse’s ability to pay. The court has full plenary power and discretion to resolve all issues in a divorce case, but it is guided by concepts of “equity” rather than concepts of “fairness,” and it often has no choice but to consider the “practicalities” of the situation. A party may think something is “unfair,” but it may very well be “equitable” in the eyes of the court. As a result, one or both parties could be very unhappy with the court’s decisions, if there is a final hearing in the case, and the parties have turned “their fate” over to the court. HELPFUL HINT: The court is “all powerful” with full discretion to rule as it sees fit. No matter what the circumstances, I work hard for and with my clients to achieve their objectives. I see divorce as an opportunity for you to start anew, to re-direct your life in positive ways for you and your family. With all of my clients, I develop a partnership, and I say very emphatically, “The more you can agree on—the more time, anxiety, and money you will save.” No question. The more time you spend organizing your thoughts, your documents, and your life, as you go through the divorce process, the better it will be for you and your family. This will also go a long way toward achieving your ultimate objectives. Of course, it takes both sides to come to agreement to settle. If one party is particularly unreasonable or rigid, then the strategy has to be adjusted. Over my career, I have been an aggressive prosecutor and a passionate advocate for my client’s interests. So, while I favor settlement, if that is not possible, I will fight for and defend your interests with vigor and passion. HELPFUL HINT: Take actions that are designed to further the long view for your future. Civil litigation is, for all intents and purposes, about money! Generally, civil suits involve one party or a number of parties who have a dispute with another party or parties or a claim against another party or parties. So, "winning" a case is all about the proof. You may think you are absolutely right, BUT you must prove your case with witnesses and physical evidence, and you must prove your case by a preponderance of evidence, meaning you have to tilt the scales in your favor, beyond 50%, to win. Again, this takes a great deal of preparation, collection of all relevant and available evidence, and the creation of a strategy that is designed to persuade the court that you have met your burden of proof and are entitled to "win your case." Now, after winning a judgment in your favor, you have to be able "to collect" on your claim--which may be even harder than winning the case in the first place. I have tried more than 50 federal and state jury trials. I have also prepared hundreds and hundreds of witnesses for trials, hearings, depositions, and mediations. I won a million dollar verdict in a car accident case involving an injured party with a heart problem, my client. I also won a multi-million dollar verdict in a civil sexual assault case in federal court in Connecticut. Unfortunately, however, in that case, the defendant was a judgment proof musician, but my client was vindicated, so she was very gratified with the outcome and was able to move on with her life. With my years of experience, I am most aware of the kind of preparation that is required in civil disputes. But, again, I form a partnership with my clients, and everything they do to help themselves and their cases goes a long way toward achieving their objectives. Disclaimer: The content of this website has been prepared by attorney Carole D. Brown for informational purposes only and may not apply to your particular facts or circumstances. It is a general discussion only and represents commentary of the author, attorney Carole D. Brown. It does not contain a complete restatement of the laws of the State of Maryland, and you should not rely on any information contained in this website without seeking professional counsel. The statements herein are NOT intended to be taken as “legal advice or counsel” with respect to the facts and circumstances of your case, and your receipt of this information does not create an attorney/client relationship with attorney Carole D. Brown. In addition, Information sent to attorney Carole D. Brown through this website does not create an attorney/client relationship. Please note that information sent via this website may not be secure, so users should take care not to send confidential information via this website.